If you prefer to buy without logging in, you can use the form below. 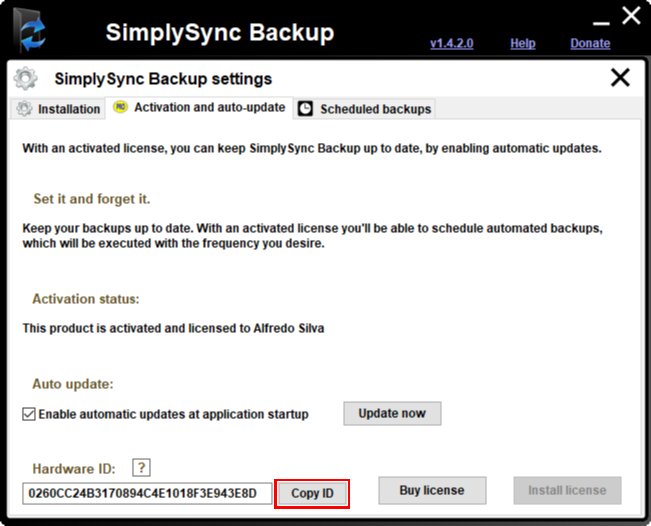 With a SimplySync Backup license you can enable automatic updates and scheduled backups. Note: This type of license will only work in one PC. To get started, just fill out the form below. Hardware ID: Where do I get this? 2. Press the Copy ID button as shown in the picture above, to copy the hardware ID's text to the clipboard. 3. Paste the copied text in the Hardware ID field above. If you're purchasing from a different device, you can manually enter the hardware ID into the corresponding field.